“If you have no vote, you have no voice” is the message from Operation Disabled Vote a new project that aims to get more Deaf and disabled people voting. The government have cut services for disabled people and young people disproportionately – the two groups that vote the least. Coincidence? Operation Disabled Vote don’t think so. Find out more about the project here. A BSL translation is available. Register to vote! Have your voice heard. 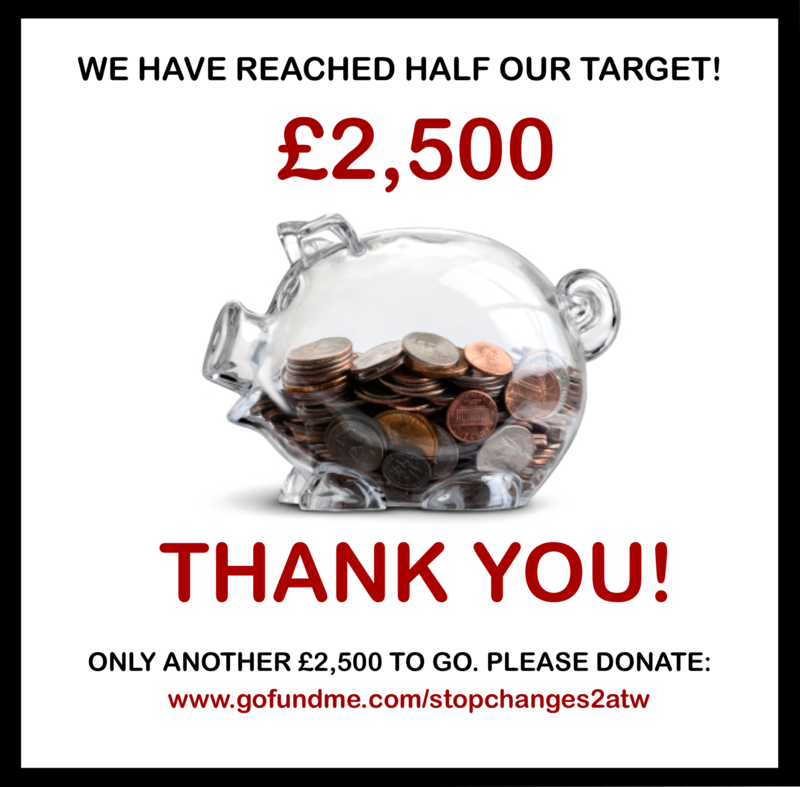 Why is the Stop Changes campaign helping someone find interpreting support? Doesn’t this go against campaigning and standing firm? Campaigns such as ours won’t usually carry out acts such as helping to find interpreters. We absolutely do not support propping up governments failures or filling gaps in support however, in this particular case there simply isn’t the time to wait for legal support. We are going to be getting legal support for the individual, but her business will go under if we do nothing. Stop Changes have seen horrendous cases and treatment whereby people are facing forced redundancies, capability proceedings and demotions. In all these cases however, the individual is being supported. In this case, the individual has no support. We were contacted at a time when she is at the point of giving up. It takes a lot to set up a business and to put in the hours of work needed to make it a success. This business makes most of its annual income at this one event. We will be asking our lawyers to provide urgent assistance and hope that we can get the AtW funding reinstated. If this happens then the interpreters booked will be reimbursed for their time, however they need to be prepared that this may not happen. Rather to be dishonest and leave interpreters out of pocket, we felt the best way to handle the situation would be to ask for people who were prepared to be volunteers. The government is trying to be divisive. It wants interpreters to take the blame for its actions and treatment of deaf people. We aren’t going to allow that to happen. We aren’t prepared to watch someone’s livelihood be destroyed. Access to Work provision isn’t simply about work. It’s about feeling valued. Sometimes people that are about to give up, need to be reminded that they are valued. Coming together IS our campaign. Judicial review – your support is needed. “I want to tell you about about Stop Changes, and the letter they have sent to start a judicial review. Leigh Day the human rights lawyers wrote the letter which includes our complaints, problems and issues with Access to Work. There are lots of different cases and different people involved. We will be challenging Iain Duncan Smith at the DWP. The aim of the judicial review is to help everyone. 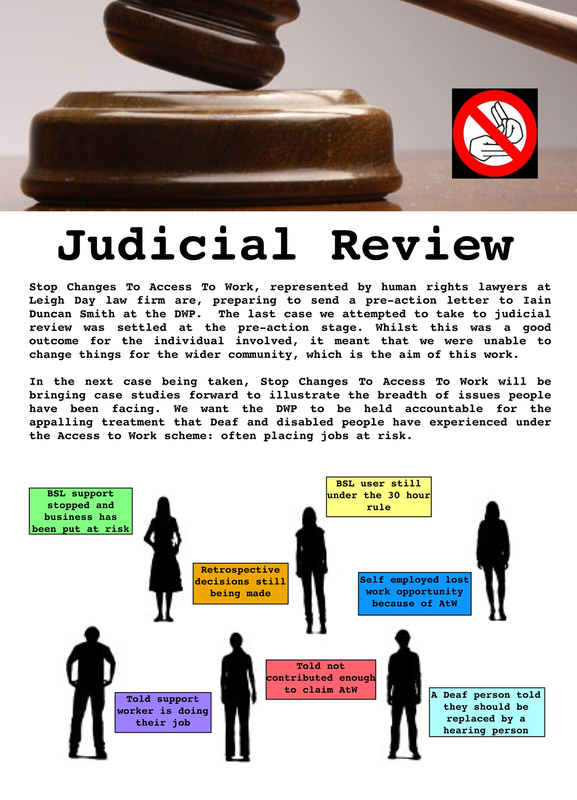 The Stop Changes to Access to Work needs donations to support the judicial review which will support all Deaf people and be of benefit to everyone, not just a few individuals”. Sue Billam, Stop Changes to Access to Work. Stop Changes to Access To Work are asking for your help. Christmas are a vital part of her work and income. completely; she is challenging this with our support. Corvette to miss yet another opportunity, no thanks to Access to Work. News update: New pre-action letter sent to DWP to start judicial review. To make things easier, we have finally found a website that was happy to host our fundraising. You can either continue to donate on the Stopchanges website (this one), or use Gofundme. AtW is ‘epistemic injustice’ at its best… Or should that be worst! The Limping Chicken article: Should Access to Work’s treatment of Deaf people be seen as ‘epistemically injustice’? Rally Speech: Geraldine O’Halloran, Founding member. Geraldine O’Halloran reminds us of how far we’ve come. From the Deaf job clubs 25 years ago to now. We urge you all to join our campaign and reclaim our voice!